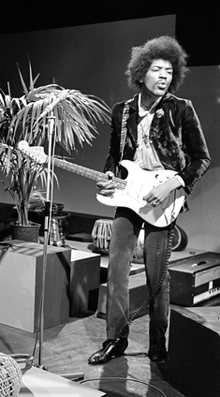 James Marshall "Jimi" Hendrix (born Johnny Allen Hendrix; November 27, 1942 – September 18, 1970) wis an American rock guitarist, sangster, an sangwriter. Awtho his mainstream career spanned anerly fower years, he is widely regairdit as ane o the maist influential electric guitarists in the history o popular muisic, an ane o the maist celebratit muisickers o the 20t century. This page wis last eeditit on 10 Apryle 2017, at 01:13.